The letter H, the numerical value of which is five, and which is sometimes used as a symbol of Bahá’u’lláh. See also : Bahá’u’lláh, The Seven Valleys and The Four Valleys ~ page 56, footnote 40. Action or utterance traditionally attributed to the Prophet Muḥammad or to one of the holy Imáms. Major Israeli port city on and around Mount Carmel. Administrative Centre of the Bahá’í Faith. Muslim title, one who has made the pilgrimage to Mecca. A highly respected Bahá’í of ‘Ishqábád, martyred 1889. A merchant; full name Ḥájí Muḥammad-Naṣír; martyred in Rasht in a.h. 1300 (1882-83). A Bahá’í merchant from Qazvín, Persia, known as Nabíl Ibn-i-Nabíl; he lived in Istanbul from 1882 and committed suicide in that city on the 9th of Rajab 1307 (March 1, 1890). “Prince of Martyrs,” the title given to Muḥammad’s uncle, ‘Abdu’l-Muṭṭalib. Eminent Bahá’ís appointed by Bahá’u’lláh to stimulate the propagation and ensure the protection of the Faith. ‘Abdu’l-Bahá in His Will and Testament conferred authority on the Guardian to appoint Hands of the Cause and specified their duties. Shoghi Effendi, in a message dated October 1957 to the Bahá’í world, called the Hands of the Cause of God “the Chief Stewards of Bahá’u’lláh’s embryonic World Commonwealth.” After his death on 4 November 1957 the Hands of the Cause of God assumed responsibility for preserving the unity of the Bahá’í Faith and for guiding the Bahá’í world community to the victorious completion of the Ten Year World Crusade planned by Shoghi Effendi. They also called for the election of the Universal House of Justice in 1963 and requested the friends not to elect them, leaving them free to discharge their own specific responsibilities. Following the formation of the Universal House of Justice, five Hands of the Cause of God were selected by fellow Hands of the Cause to serve at the Bahá’í World Centre, while the rest continued their continental responsibilities, which included overseeing the work of the Auxiliary Board members. Finding itself unable to appoint or legislate in order to appoint additional Hands of the Cause of God, the Universal House of Justice, in a cable dated 21 June 1968 and a letter dated 24 June 1968, announced the establishment of the institution of the Continental Boards of Counsellors to extend the functions of the Hands of the Cause of God into the future. The Hands of the Cause of God were then freed of responsibility for directing the work of Auxiliary Board members and were all given world-wide responsibilities. See also : Auxiliary Boards; Conclave; Continental Boards of Counsellors; International Teaching Centre. “The Most Holy Court”: a designation Shoghi Effendi gave to the north-western quadrant of the gardens surrounding the Shrine of Bahá’u’lláh in Bahjí. It lies immediately outside the entrance to Bahá’u’lláh’s tomb. Full name, Muḥammad Haṣan, a believer from the ancestral province of Bahá’u’lláh. He is a son of Mírzá Zaynu’l-‘Abidín, a paternal uncle of Bahá’u’lláh. A devoted Bahá’í who, under Bahá’u’lláh and then ‘Abdu’l-Bahá travelled widely in the service of the Cause and suffered much persecution. 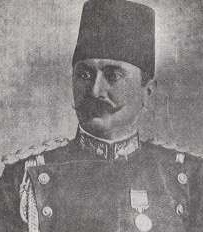 Died in Haifa, a.d. 1920. Author of the interesting narative Bihjatu’ṣ-Ṣudúr (Delight of Hearts). Known by Western pilgrims as the Angel of Mount Carmel. The word is composed in Arabic of the four letters “Há”, “Yá”, “Káf” and “Lám” (HYKL). Its first letter is taken to symbolise the word “Huvíyyah” (Essence of Divinity); its second letter the word “Qadir” (Almighty), of which “Yá” is the third letter; its third letter the word “Karím” (All-Bountiful); and its fourth letter the word “Faḍl” (Grace), of which “Lám” is the third letter. “The Sacred Fold”; official title designating the headquarters of Bahá’í administrative activity in a particular country or region. An Idumaean by race, but brought up a Jew. He was appointed by the Roman Senate in 40 B.C. as king of Judea. He rebuilt the Temple in Jerusalem. Alternative spellings: Hijra; al-Hijra (the Hegira); Hejira. Hejaz; a region in southwestern Arabia which may be considered the holy land of the Muslims since it contains the sacred cities of Medina and Mecca and many other places connected with the history of Muḥammad. Ḥaram means ‘sanctuary’. It refers to the two areas near the Ka‘bih in which blood revenge was forbidden, and also to the four months in the Arabic Calendar to which the same prohibition applied. Ḥill means the unprotected area and the unprotected months. The quotation from the poem made in Epistle to the Son of the Wolf on p. 17 means “the judge has condemned me to death both in Ḥaram and Ḥill”. According to the Abjad notation, the numerical value of the word “Ḥín” is 68. It was in the year 1268 A.H. that Bahá’u’lláh, while confined in the Síyáh-Chál of Ṭihrán, received the first intimations of His divine mission. Title of Prince Murad Mírzá, grandson of Fatḥ-‘Alí Sháh. The Day of the Covenant, 4 Qawl, and the Ascension of ‘Abdu’l-Bahá, 6 Qawl, are commemorated annually but are not days on which work is to be suspended. See also : Bahá’í Calendar. Generally, this term refers to the family of Bahá’u’lláh; however, it has had somewhat different meanings at different periods of Bahá’í history and in different contexts. Sites in Írán, ‘Iráq, Turkey, and Israel that are associated with significant events in the lives of Bahá’u’lláh, the Báb, and ‘Abdu’l-Bahá. See the discussion in Paris Talks on The Holy Spirit, the Intermediary Power Between God and Man (pages 57-59) for further information. ‘Abdu’l-Bahá explains that “The blessed Person of the Promised One [Bahá’u’lláh] is interpreted in the Holy Book as the Lord of Hosts—the heavenly armies. By heavenly armies those souls are intended who are entirely freed from the human world, transformed into celestial spirits and have become divine angels. Such souls are the rays of the Sun of Reality who will illumine all the continents” (“Tablets of the Divine Plan”, 8.2, page 49). See also : Lord of Hosts. The house in ‘Akká that ‘Abdu’l-Bahá rented in 1896 and that served as His residence until He moved to Haifa in 1910. For a discussion of the historical significance of the House, see The Universal House of Justice, Messages 1963 to 1986, message no. 157, page 290. Author of Portals to Freedom. Howard Colby Ives met ‘Abdu’l-Bahá in 1912. At the time, he was a Unitarian minister. His meeting with ‘Abdu’l-Bahá led to his becoming a Bahá’í. Leaving his ministerial position, he and his wife, Mabel Rice-Wray Ives, traveled around America teaching the Faith. As well as a writer, Howard Colby Ives was also a poet. He had as well a prolific correspondence with both ‘Abdu’l-Bahá and with Shoghi Effendi. A litter carried by a camel, mule, horse, or elephant for travelling purposes. A prophet sent to the tribe of ‘Ád. He was descended from Noah and is referred to in the Qur’án in súrih 7:65-72; súrih 11:50-60; and in súrih 26:123-139. He summoned the people to the worship of One God, but was rejected. See also : Súrih of Húd. “The Right of God”: one of the fundamental Bahá’í ordinances of the Bahá’í Faith, it is a great law and a sacred institution laid down by Bahá’u’lláh in the Kitáb-i-Aqdas. It is one of the key instruments for constructing the foundation and supporting the structure of the World Order of Bahá’u’lláh. Its far-reaching ramifications extend from enabling individuals to express their devotion to God in a private act of conscience that attracts divine blessings and bounties for the individual, promotes the common good, and directly connects individuals with the Central Institution of the Faith, to buttressing the authority and extending the activity of the Head of the Faith. The law prescribes that each Bahá’í shall pay a certain portion of his accumulated savings after the deduction of all expenses and of certain exempt properties such as one’s residence. These payments provide a fund at the disposition of the Head of the Faith for carrying out beneficent activities. Ḥuqúqu’lláh is administered by the Universal House of Justice, and payments are made to trustees appointed by the Universal House of Justice in every country or region. In providing a regular and systematic source of revenue for the Central Institution of the Cause, Bahá’u’lláh has assured the means for the independence and decisive functioning of the World Centre of His Faith. The fundamentals of the law of Ḥuqúqu’lláh are promulgated in the Kitáb-i-Aqdas. Further elaborations of its features are found in other Writings of Bahá’u’lláh and in those of ‘Abdu’l-Bahá, Shoghi Effendi, and the Universal House of Justice. The law was codified in 1987 and made universally applicable as of Riḍván 1992 to all who profess belief in Bahá’u’lláh. For further information, see : Ḥuqúqu’lláh: Extracts from the Writings of Bahá’u’lláh, ‘Abdu’l-Bahá, Shoghi Effendi and The Universal House of Justice (1986). According to Islamic tradition, an allusion to the maidens in heaven. In The Kitáb-i-Íqán, it is used symbolically to signify inner meanings.